Was it by the arbitrary election of God that Jacob appreciated the spiritual blessings of the birthright while Esau valued only the wealth of his father? Crossing the Jordan, "Jacob came in peace to the city of Shechem, which is in the land of Canaan." Genesis 33:18, R.V. Thus the patriarch's prayer at Bethel, that God would bring him again in peace to his own land, had been granted. For a time he dwelt in the vale of Shechem. It was here that Abraham, more than a hundred years before, had made his first encampment and erected his first altar in the Land of Promise. Here Jacob "bought the parcel of ground where he had spread his tent, at the hand of the children of Hamor, Shechem's father, for a hundred pieces of money. And he erected there an altar, and called it El-elohe-Israel" (verses 19, 20)—God, the God of Israel." Like Abraham, Jacob set up beside his tent an altar unto the Lord, calling the members of his household to the morning and the evening sacrifice. It was here also that he dug the well to which, seventeen centuries later, came Jacob's Son and Saviour, and beside which, resting during the noontide heat, He told His wondering hearers of that "well of water springing up into everlasting life." John 4:14. The tarry of Jacob and his sons at Shechem ended in violence and bloodshed. The one daughter of the household had been brought to shame and sorrow, two brothers were involved in the guilt of murder, a whole city had been given to ruin and slaughter, in retaliation for the lawless deed of one rash youth. The beginning that led to results so terrible was the act of Jacob's daughter, who "went out to see the daughters of the land," thus venturing into association with the ungodly. He who seeks pleasure among those that fear not God is placing himself on Satan's ground and inviting his temptations. The treacherous cruelty of Simeon and Levi was not unprovoked; yet in their course toward the Shechemites they committed a grievous sin. They had carefully concealed from Jacob their [p. 205] intentions, and the tidings of their revenge filled him with horror. Heartsick at the deceit and violence of his sons, he only said, "Ye have troubled me to make me to stink among the inhabitants of the land: . . . and I being few in number, they shall gather themselves together against me, and slay me; and I shall be destroyed, I and my house." But the grief and abhorrence with which he regarded their bloody deed is shown by the words in which, nearly fifty years later, he referred to it, as he lay upon his deathbed in Egypt: Simeon and Levi are brethren; instruments of cruelty are in their habitations. O my soul, come not thou into their secret; unto their assembly, mine honor, be not thou united. . . . Cursed be their anger, for it was fierce; and their wrath, for it was cruel." Genesis 49:5-7. Jacob felt that there was cause for deep humiliation. Cruelty and falsehood were manifest in the character of his sons. There were false gods in the camp, and idolatry had to some extent gained a foothold even in his household. Should the Lord deal with them according to their deserts, would He not leave them to the vengeance of the surrounding nations? While Jacob was thus bowed down with trouble, the Lord directed him to journey southward to Bethel. The thought of this place reminded the patriarch not only of his vision of the angels and of God's promises of mercy, but also of the vow which he had made there, that the Lord should be his God. He determined that before going to this sacred spot his household should be freed from the defilement of idolatry. He therefore gave direction to all in the encampment, "Put away the strange gods that are among you, and be clean, and change your garments: and let us arise, and go up to Bethel; and I will make there an altar unto God, who answered me in the day of my distress, and was with me in the way which I went." With deep emotion Jacob repeated the story of his first visit to Bethel, when he left his father's tent a lonely wanderer, fleeing for his life, and how the Lord had appeared to him in the night vision. As he reviewed the wonderful dealings of God with him, his own heart was softened, his children also were touched by a subduing power; he had taken the most effectual way to prepare them to join in the worship of God when they should arrive at Bethel. "And they gave unto Jacob all the strange gods which [p. 206] were in their hand, and all their earrings which were in their ears; and Jacob hid them under the oak which was by Shechem." God caused a fear to rest upon the inhabitants of the land, so that they made no attempt to avenge the slaughter at Shechem. The travelers reached Bethel unmolested. Here the Lord again appeared to Jacob and renewed to him the covenant promise. "And Jacob set up a pillar in the place where He talked with him, even a pillar of stone." At Bethel, Jacob was called to mourn the loss of one who had long been an honored member of his father's family—Rebekah's nurse, Deborah, who had accompanied her mistress from Mesopotamia to the land of Canaan. The presence of this aged woman had been to Jacob a precious tie that bound him to his early life, and especially to the mother whose love for him had been so strong and tender. Deborah was buried with expressions of so great sorrow that the oak under which her grave was made, was called "the oak of weeping." It should not be passed unnoticed that the memory of her life of faithful service and of the mourning over this household friend has been accounted worthy to be preserved in the word of God. 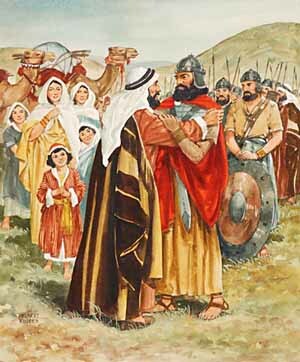 From Bethel it was only a two days' journey to Hebron, but it brought to Jacob a heavy grief in the death of Rachel. Twice seven years' service he had rendered for her sake, and his love had made the toil but light. How deep and abiding that love had been, was shown when long afterward, as Jacob in Egypt lay near his death, Joseph came to visit his father, and the aged patriarch, glancing back upon his own life, said, "As for me, when I came from Padan, Rachel died by me in the land of Canaan in the way, when yet there was but a little way to come unto Ephrath: and I buried her there in the way of Ephrath." Genesis 48:7. In the family history of his long and troubled life the loss of Rachel was alone recalled. Before her death Rachel gave birth to a second son. With her parting breath she named the child Benoni, "son of my sorrow." But his father called him Benjamin, "son of my right hand," or "my strength." Rachel was buried where she died, and a pillar was raised upon the spot to perpetuate her memory. At last Jacob came to his journey's end, "unto Isaac his father unto Mamre, . . . which is Hebron, where Abraham and Isaac sojourned." Here he remained during the closing years of his father's life. To Isaac, infirm and blind, the kind attentions of this long-absent son were a comfort during years of loneliness and bereavement. Jacob and Esau met at the deathbed of their father. Once the elder brother had looked forward to this event as an opportunity for revenge, but his feelings had since greatly changed. And Jacob, well content with the spiritual blessings of the birthright, resigned to the elder brother the inheritance of their father's wealth—the only inheritance that Esau sought or valued. They were no longer estranged by jealousy or hatred, yet they parted, Esau removing to Mount Seir. God, who is rich in blessing, had granted to Jacob worldly wealth, in addition to the higher good that he had sought. The possessions of the two brothers "were more than that they might dwell together; and the land wherein they were strangers could not bear them because of their cattle." This separation was in accordance with the divine purpose concerning Jacob. Since the brothers differed so greatly in regard to religious faith, it was better for them to dwell apart. Esau and Jacob had alike been instructed in the knowledge of God, and both were free to walk in His commandments and to receive His favor; but they had not both chosen to do this. The two brothers had walked in different ways, and their paths would continue to diverge more and more widely. There was no arbitrary choice on the part of God by which Esau was shut out from the blessings of salvation. The gifts of His grace through Christ are free to all. There is no election but one's own by which any may perish. God has set forth in His word the conditions upon which every soul will be elected to eternal life—obedience to His commandments, through faith in Christ. God has elected a character in harmony with His law, and anyone who shall reach the standard of His requirement will have an entrance into the kingdom of glory. Christ Himself said, "He that believeth on the Son hath everlasting life: and he that believeth not the Son shall not see life." John 3:36. "Not everyone that saith unto Me, Lord, Lord, shall enter into the kingdom of heaven; but he that doeth the will of My Father which is in heaven." Matthew 7:21. And in the Revelation He declares, [p. 208] "Blessed are they that do His commandments, that they may have right to the tree of life, and may enter in through the gates into the city." Revelation 22:14. As regards man's final salvation, this is the only election brought to view in the word of God. Every soul is elected who will work out his own salvation with fear and trembling. He is elected who will put on the armor and fight the good fight of faith. He is elected who will watch unto prayer, who will search the Scriptures, and flee from temptation He is elected who will have faith continually, and who will be obedient to every word that proceedeth out of the mouth of God. The provisions of redemption are free to all; the results of redemption will be enjoyed by those who have complied with the conditions. Esau had despised the blessings of the covenant. He had valued temporal above spiritual good, and he had received that which he desired. It was by his own deliberate choice that he was separated from the people of God. Jacob had chosen the inheritance of faith. He had endeavored to obtain it by craft, treachery, and falsehood; but God had permitted his sin to work out its correction. Yet through all the bitter experience of his later years, Jacob had never swerved from his purpose or renounced his choice. He had learned that in resorting to human skill and craft to secure the blessing, he had been warring against God. From that night of wrestling beside the Jabbok, Jacob had come forth a different man. Self-confidence had been uprooted. Henceforth the early cunning was no longer seen. In place of craft and deception, his life was marked by simplicity and truth. He had learned the lesson of simple reliance upon the Almighty Arm, and amid trial and affliction he bowed in humble submission to the will of God. The baser elements of character were consumed in the furnace fire, the true gold was refined, until the faith of Abraham and Isaac appeared undimmed in Jacob. The sin of Jacob, and the train of events to which it led, had not failed to exert an influence for evil—an influence that revealed its bitter fruit in the character and life of his sons. As these sons arrived at manhood they developed serious faults. The results of polygamy were manifest in the household. This terrible evil tends to dry up the very springs of love, and its influence weakens the most sacred ties. The jealousy of the several mothers had [p. 209] embittered the family relation, the children had grown up contentious and impatient of control, and the father's life was darkened with anxiety and grief. There was one, however, of a widely different character—the elder son of Rachel, Joseph, whose rare personal beauty seemed but to reflect an inward beauty of mind and heart. Pure, active, and joyous, the lad gave evidence also of moral earnestness and firmness. He listened to his father's instructions, and loved to obey God. The qualities that afterward distinguished him in Egypt—gentleness, fidelity, and truthfulness—were already manifest in his daily life. His mother being dead, his affections clung the more closely to the father, and Jacob's heart was bound up in this child of his old age. He "loved Joseph more than all his children." But even this affection was to become a cause of trouble and sorrow. Jacob unwisely manifested his preference for Joseph, and this excited the jealousy of his other sons. As Joseph witnessed the evil conduct of his brothers, he was greatly troubled; he ventured gently to remonstrate with them, but only aroused still further their hatred and resentment. He could not endure to see them sinning against God, and he laid the matter before his father, hoping that his authority might lead them to reform. Jacob carefully avoided exciting their anger by harshness or severity. With deep emotion he expressed his solicitude for his children, and implored them to have respect for his gray hairs, and not to bring reproach upon his name, and above all not to dishonor God by such disregard of His precepts. Ashamed that their wickedness was known, the young men seemed to be repentant, but they only concealed their real feelings, which were rendered more bitter by this exposure. "Shalt thou indeed reign over us? or shalt thou indeed have dominion over us?" exclaimed his brothers in envious anger. Soon he had another dream, of similar import, which he also related: "Behold, the sun and the moon and the eleven stars made obeisance to me." This dream was interpreted as readily as the first. The father, who was present, spoke reprovingly—"What is this dream that thou hast dreamed? Shall I and thy mother and thy brethren indeed come to bow down ourselves to thee to the earth?" Notwithstanding the apparent severity of his words, Jacob believed that the Lord was revealing the future to Joseph. As the lad stood before his brothers, his beautiful countenance lighted up with the Spirit of inspiration, they could not withhold their admiration; but they did not choose to renounce their evil ways, and they hated the purity that reproved their sins. The same spirit that actuated Cain was kindling in their hearts. The brothers were obliged to move from place to place to secure pasturage for their flocks, and frequently they were absent from home for months together. After the circumstances just related, they went to the place which their father had bought at Shechem. Some time passed, bringing no tidings from them, and the father began to fear for their safety, on account of their former cruelty toward the Shechemites. He therefore sent Joseph to find them, and bring him words as to their welfare. Had Jacob known the real feeling of his sons toward Joseph, he would not have trusted him alone with them; but this they had carefully concealed. With a joyful heart, Joseph parted from his father, neither the aged man nor the youth dreaming of what would happen before they should meet again. When, after his long and solitary journey, Joseph arrived at Shechem, his brothers and their flocks were not to be found. Upon inquiring for them, he was directed to Dothan. He had already traveled more than fifty miles, and now an additional distance of fifteen lay before him, but he hastened on, forgetting his weariness in the thought of relieving the anxiety of his father, and meeting the brothers, whom, despite their unkindness, he still loved. His brothers saw him approaching; but no thought of the long journey he had made to meet them, of his weariness and hunger, of his claims upon their hospitality and brotherly love, [p. 211] softened the bitterness of their hatred. The sight of the coat, the token of their father's love, filled them with frenzy. "Behold, this dreamer cometh," they cried in mockery. Envy and revenge, long secretly cherished, now controlled them. "Let us slay him," they said, "and cast him into some pit, and we will say, Some evil beast hath devoured him; and we shall see what will become of his dreams." They would have executed their purpose but for Reuben. He shrank from participating in the murder of his brother, and proposed that Joseph be cast alive into a pit, and left there to perish; secretly intending, however, to rescue him and return him to his father. Having persuaded all to consent to this plan, Reuben left the company, fearing that he might fail to control his feelings, and that his real intentions would be discovered. Joseph came on, unsuspicious of danger, and glad that the object of his long search was accomplished; but instead of the expected greeting, he was terrified by the angry and revengeful glances which he met. He was seized and his coat stripped from him. Taunts and threats revealed a deadly purpose. His entreaties were unheeded. He was wholly in the power of those maddened men. Rudely dragging him to a deep pit, they thrust him in, and having made sure that there was no possibility of his escape, they left him there to perish from hunger, while they "sat down to eat bread." But some of them were ill at ease; they did not feel the satisfaction they had anticipated from their revenge. Soon a company of travelers was seen approaching. It was a caravan of Ishmaelites from beyond Jordan, on their way to Egypt with spices and other merchandise. Judah now proposed to sell their brother to these heathen traders instead of leaving him to die. While he would be effectually put out of their way, they would remain clear of his blood; "for," he urged, "he is our brother and our flesh." To this proposition all agreed, and Joseph was quickly drawn out of the pit. As he saw the merchants the dreadful truth flashed upon him. To become a slave was a fate more to be feared than death. In an agony of terror he appealed to one and another of his brothers, but in vain. Some were moved with pity, but fear of derision kept them silent; all felt that they had now gone too far to retreat. If Joseph were spared, he would doubtless report them to the father, [p. 212] who would not overlook their cruelty toward his favorite son. Steeling their hearts against his entreaties, they delivered him into the hands of the heathen traders. The caravan moved on, and was soon lost to view. Reuben returned to the pit, but Joseph was not there. In alarm and self-reproach he rent his garments, and sought his brothers, exclaiming, "The child is not; and I, whither shall I go?" Upon learning the fate of Joseph, and that it would now be impossible to recover him, Reuben was induced to unite with the rest in the attempt to conceal their guilt. Having killed a kid, they dipped Joseph's coat in its blood, and took it to their father, telling him that they had found it in the fields, and that they feared it was their brother's. "Know now," they said, "whether it be thy son's coat or no." They had looked forward to this scene with dread, but they were not prepared for the heart-rending anguish, the utter abandonment of grief, which they were compelled to witness. "It is my son's coat," said Jacob; "an evil beast hath devoured him. Joseph is without doubt rent in pieces." Vainly his sons and daughters attempted to comfort him. He "rent his clothes, and put sackcloth upon his loins, and mourned for his son many days." Time seemed to bring no alleviation of his grief. "I will go down into the grave unto my son mourning," was his despairing cry. The young men, terrified at what they had done, yet dreading their father's reproaches, still hid in their own hearts the knowledge of their guilt, which even to themselves seemed very great. Click here to read the next chapter: "Joseph in Egypt"